Been hearing more and more about CANIDAE dog food? We certainly have! With owners putting more and more emphasis on proper dog nutrition (which we love), it’s no surprise that CANIDAE has become increasingly more talked about. So, if you’re after some healthy dog food, we can help you decide whether this brand will give your puppy or grown pooch what he needs.In our CANIDAE dog food reviews, we’ll share everything we’ve learned from researching the brand — where it’s based, what kind of ingredients they use, and what it offers for dogs with special dietary requirements. Why the Canidae Puppy Food Reviews and Canidae Dog Food Reviews? Does my small-breed puppy really need those little kibble pieces? Can my puppy eat sweet potato if he’s allergic to potato? 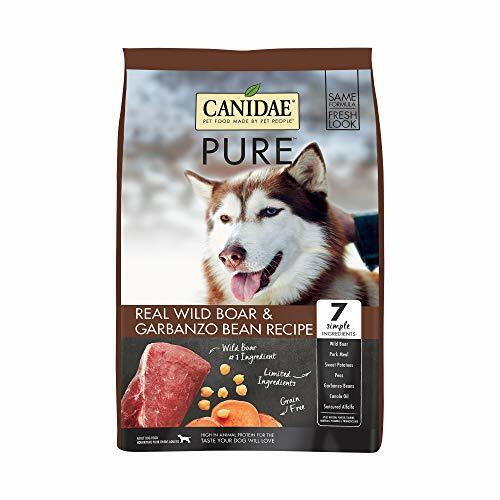 Established in 1996, Canidae is a US, California-based company. It is an independent business and family-owned, and their dog food is mostly prepared in Texas at their Ethos Nutrition Center. One key thing we feel says a lot about who CANIDAE are: the brand crafts its dog food using human-grade meat or fish. This means that not only is the quality of ingredients much higher than some other brands, but the ingredients lists are simple to get to grips with. No confusion about what X, Y, or Z could possibly do to your puppy, that is. A good start! Canidae provides pet owners with a lot of healthy choices, which we like the most about this brand. There are ample options for pups and grown dogs with different dietary needs, and these fall into several different categories. 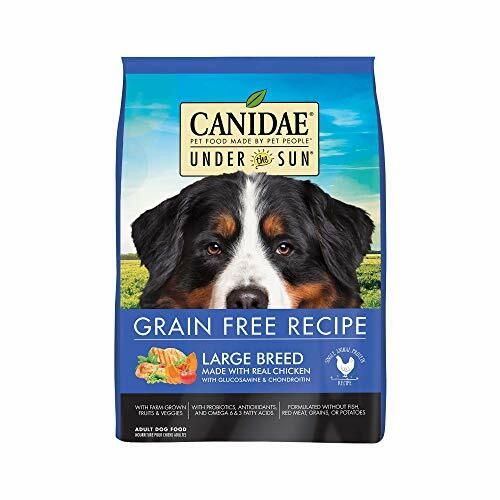 CANIDAE Under The Sun Grain-Free includes farm-grown veggies and single-meat proteins that make it perfect for intolerant dogs. These limited ingredient formulas are all made without any potato and come at a nice, affordable price compared to some other hypoallergenic formulas on the market. 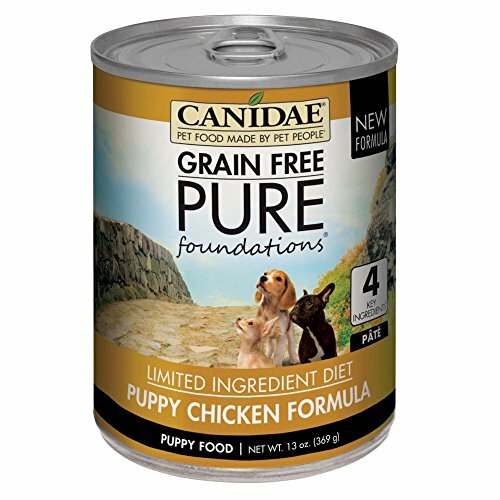 CANIDAE Grain-Free Pure is also for dogs who need to restrict the number of meat ingredients they’re exposed to. The top thing in these 7-10 ingredient blends is always fresh fish or meat (there are many different flavors available! ), and this makes a tasty wholesome meal along with whole veggies. 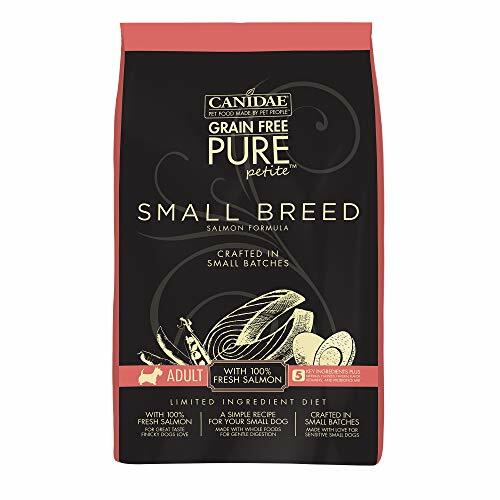 CANIDAE Pure Ancestral is about high-protein, evolutionary formulas that use several (6-7) meat ingredients for variety. Because they offer slightly higher protein (around 28% plus), owners of particularly active or muscly breeds might consider these — Boxers, Pit Bulls, Dobermans, and Rotties, for example. 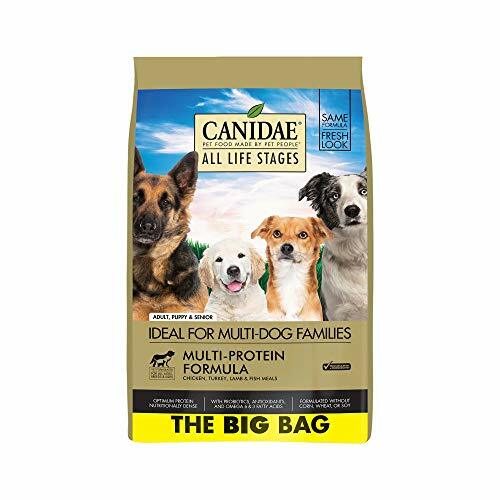 CANIDAE All Life Stages is crafted so that all different ages and sizes of puppies (and grown dogs, of course) can enjoy it. That means less transitioning if you’ve got growing pups, and it means you can feed dogs of more than one breed from the same bag. Convenient! Within these main brand categories, it’s also easy to find size-specific options, and there are also products that cater to dogs that require higher protein or weight management recipes. Nice, right? 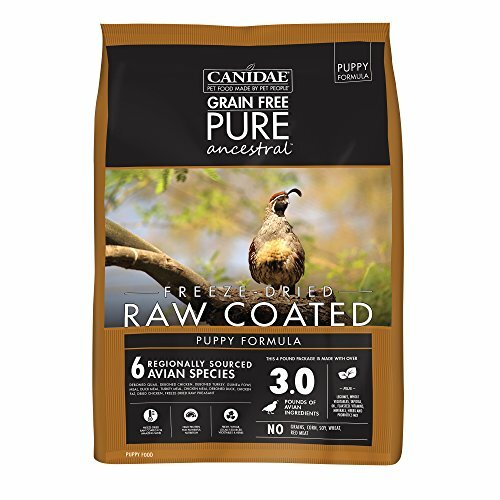 You might also be happy to hear that CANIDAE dog food is made without chemical preserving agents and that our CANIDAE dog food reviews show there are very few filler ingredients in their recipes. CANIDAE does manufacture several of its products outside of its own facilities. Their grain-free formulas, to be specific, are prepared over at Diamond Pet Foods, which means that there is one past CANIDAE pet food recall to be aware of. In 2012, Diamond carried out a fairly large-scale voluntary recall of several dog food products due to suspected Salmonella contamination. CANIDAE’s Platinum Food, All Stages, Lamb Meal, and Chicken Meal recipes from Diamond’s Gaston plant were taken off the shelves. Besides one dog food recall (which affected a LOT of other brands), they have a stellar safety record. So, with that many tasty-sounding products to review, let’s get started! 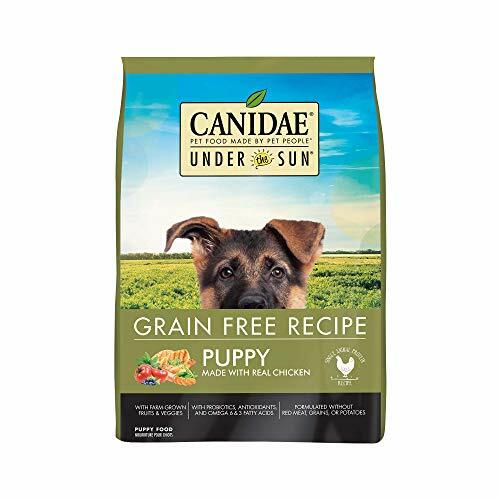 CANIDAE creates a vast array of gluten- and grain-free formulas in it’s Under The Sun and Pure ranges. That includes puppy and grown foods, plus breed-specific formulas. There’s zero red meat, grains, or fish in this simple recipe, just appetizing chicken and wholesome legumes for protein. Formulated especially for large dogs and pups, it’s definitely a top choice for owners with Golden Retrievers, German Shepherds, Dobermans, Rotties, and more. While it’s crafted to meet AAFCO standards for All Life Stages, it offers only 25% protein. That may be a bit less than some puppy owners might like for their growing little ones. This offers your pup lot of tasty nutrients and all the protein and fat you’d expect from delicious chicken. Plus, it provides your large-breed puppy or dog with chondroitin and healthy glucosamine! This isn’t just for small-breeds, it’s also made in small, controlled batches that allow for greater quality control. In this chicken recipe, you’ll notice the kibble is smaller so your dog can eat much more comfortably. The 5 main ingredients are chicken, egg, peas, lentils, and chicken fat — all nutritious and yummy! At 448 k/Cal per cup, your dog will be getting all the energy he needs throughout the day. This is perfect for toy dogs as well as smaller breeds, and has Omega acids inside that are especially beneficial if you’ve got a long-haired dog to take care of. We’ve included our Canidae Life Stages Dog Food review in this section, as it’s suitable for all life stages and incredibly popular with so many puppy owners! There are so many different types of meat in this high-protein puppy blend, from guinea fowl and duck to turkey, quail, and chicken! Uses freeze-dried high-quality pheasant to lock in maximum nutrients. We can’t find anything to mention here, it’s a well-priced and high-grade product, with a balanced nutrient profile. This Ancestral puppy recipe is high in protein and contains 3 pounds of poultry inclusions for a 4-pound bag. You’ll also find lovely Omega-3 and 6 in here for skin health. Chicken, turkey, and lamb are the headlining ingredients in this well-known, much-loved mix for development and maintenance. Because it’s for All Life Stages, it’s also great for senior and pregnant dogs. Includes tasty fruits and veggies for fiber and vitamins. 24% protein may be a slightly lower figure than some puppy owners are after. We like that this food is suitable for all kinds of breeds and all stages of life. And, we like that it has some useful additions to keep digestion smooth, like oatmeal and natural fiber. This particular formula used to come in different packaging, but the key things we loved are still all there! Technically, though, it’s suitable for dogs of all ages! Salmon oil provides ALA for eye and brain development. As with other Under The Sun puppy foods, this is potato-free and uses only one animal protein. It also includes a probiotic mix that will help your pup digest his food smoothly. Delicious, moist chicken and yummy egg provide the protein in this canned puppy dinner. There’s also some healthy salmon oil inside that contributes glucosamine and Omega acids. Includes salmon oil, a known source of Omega-3 and glucosamine. In true CANIDAE style, there are only a few high-quality ingredients in here, yet the formula is balanced and will give your pup all the AAFCO-approved nutrients for healthy development. Yummy! CANIDAE is well-known for creating exceptional Limited Ingredient formulas that use only a few ingredients. As well as the delectable Wild Boar recipe we’ve reviewed first, they also create Lamb, Duck, and Salmon flavors of hypoallergenic dog food. Includes Omega-6 from canola oil. We love that this is so simple in terms of ingredients, yet offers such tasty flavors for your intolerant dog, so we have no complaints! This contains no potato, and is entirely gluten- and potato-free to boot. So it’s a great formula for dogs with different kinds of intolerances, and at an affordable price for a large bag. The size of a dog food kibble doesn’t really affect the nutrition that your puppy is getting from his food. However, as you’ve already noticed in our CANIDAE puppy food reviews, manufacturers these days are making more and more adjustments like special kibble so that small breeds can eat more comfortably. If kibble is a bit too big for your Pom, Beagle, Daschund, or Poodle puppy to eat comfortably, there may also be a greater chance that he could choke if he’s in a (probably hungry) rush. Smaller kibble bits are also found in other puppy foods, not just in small-breed specific food. For larger breeds, however, they may not need specially-crafted little pieces as they get older. As they get stronger, bigger jaws and teeth, they can switch over to an adult food that lets them chew. This even helps to clean their teeth! If you’ve got a puppy who doesn’t react well to dog food with potato ingredients, you’ll probably be happy to know that sweet potato is scientifically in a totally different vegetable family. In that sense, they are not likely to exhibit the same symptoms if they eat a puppy food that contains sweet potatoes — unless they also happen to be allergic to them too! It is actually more likely (although not a given) that your pup would respond adversely to ingredients like tomato, peppers, and aubergine, as these are in the same Solanaceae family as white potatoes. Do your pup a favor and check with his vet before you make any significant dietary changes, however, as it’s always best to err on the side of caution with our best buddies.